I've been smitten by this guy in the past three weeks. I do not know why and how I've become interested with this guy whom I knew personally as one of the "hot" ones at school. 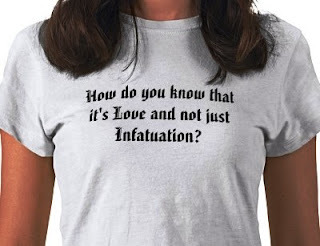 I know this is not something for me at my age, this is just terribly wrong or should I say, infatuation gone wrong. I have high respect for this guy when it comes to his skills in the kitchen, his passion about work, and his cute smile. He is gorgeous, so gorgeous, aside from myself being enamored at his presence, there were a handful of girls who felt the same way, even if they have known him for just a day or two. He is that handsome. As for myself, I looked like a winner, though this person does know I am nuts for him in a flirty manner, that deep inside my bubbly personality there is a part of me that gets me butterflies in my stomach. He somehow made me addicted to him - he was my drug. Now, classes has started and we are back to reality. Our newfound closeness has somehow made a fuss amongst the studentry, despite the funny attitude. It is just that in public, but never in reality, for I know that girls would hate me to bits when they knew I am one of them single ladies who is admiring this guy. He has a huge following I must say. There are a few flaws: he is straight (but according to my friend, I can convert him - but no I don't want that because it has a bad karma after that). and second, he is immature in some aspects. He has no consistency at all - which is a major turn off for most girls whom he dated once in a while. Thus, he got no girlfriend as of press time. I'll just be a good friend to him, and bury this feeling - or just play with the feeling until it subsides in the next few days or weeks. It is infatuation indeed, but now, its slowly waning out of me.